There are various considerations when buying baby products and gears—design, price, quality, and safety. For the wise parent, safety is first among all considerations. And one of the biggest and most important quests is that of finding the safest baby crib. Face it, as much as you’d like to, you can’t be with your baby 24/7. 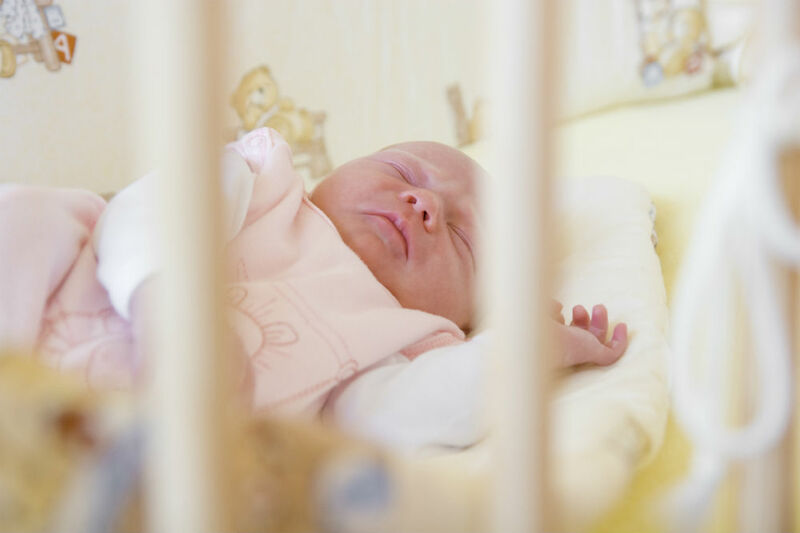 Thus, it is important to find a crib that is like a trusty nanny to your little angel. There are a lot of things that may go into the creation of your crib such as paint, flame retardants in your foam mattress, etc. 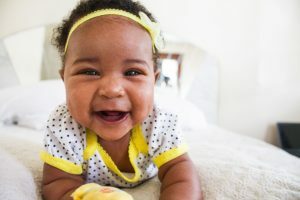 To make sure babies are not exposed to allergenic and harmful materials, as well as hazardous designs, there are organizations that look into these matters. 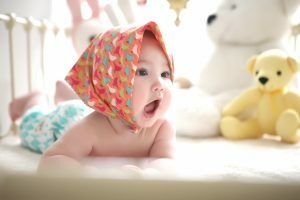 You have the JPMA (Juvenile Products Manufacturer’s Association) that tests baby products against the standards set by the ASTM (American Society for Testing Materials) International. Another one is the Oeko-Tex Standard 100, which is an independent organization that tests and certifies textile products from all stages of production. It doesn’t have drop-side railings that have been linked to 30+ infant deaths since 2000. It shouldn’t also have any missing crib slats. Also, the slats should be no more than 2 3/8 inches apart. For this, you can perform the soda pop can test. To pass, the can should not get through. All hardware must be complete, tight, working, and properly installed. Corner posts, including decorative knobs, should not be higher than 1/16 inches to prevent baby’s clothing from being caught. Mattress support hangers must be attached to the frame with bolts and hooks. Otherwise, the baby could get trapped in the space created by the unhooked mattress support. The mattress should fit snugly in the crib with no more than two fingers fitting in between the edge of the mattress and the crib panels. It should also be firm to support the baby’s growing body. Adjust the base or mattress support such that the baby cannot climb out of it. 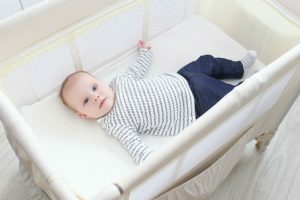 Set it to the highest for newborn babies; at the middle, when the baby is able to push on their hands and knees; and at the lowest, when the baby can already stand up. Stay out of decorative cut-outs on the headboard or footboard, as well as pictures with lead-based paints. You can check out CPSC’s recall list for this matter. CPSC (Consumer Product Safety Commission) is an independent federal agency that investigates complaints from consumers concerning unsafe products with the power to issue recalls of defective and substandard items. There are various reasons a crib model may be recalled. It doesn’t necessarily have to do with one particular type of crib that you’re buying—although that is one. While that sounds a bit negative and almost bordering on paranoia, being the worst-case scenario person can come in handy in a lot of ways, too. This is especially true when buying products newly out in the market. It takes a few incidents for the CPSC, for example, to issue recalls or ban items. So, some foresight can go a long way. If you consider yourself a forgetful person, stay clear of cribs with lock features and go for the basic types. 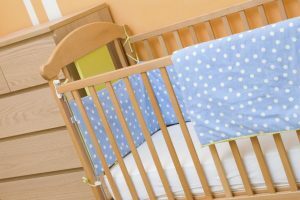 Regardless of your crib passing CPSC, ASTM, JPMI, or Oeko-Tex Standard 100, many factors can come into play in making the crib an unsafe environment for your baby. There’s the normal wear and tear that comes with everyday use. Also, constant moving around of cribs can result to loosened or unhinged parts. On a side note, pillows, comforters, stuffed toys, position devices can also be sources of suffocation, especially for a newborn baby. So, you need to keep them out of the crib. While you’re at it, keep drapes, ribbons, blind cords, toy strings and the like out of reach. Babies might climb onto them or get themselves entangled in them. With some research and foresight, you can procure and create a safe environment where your baby can sleep and explore with little supervision.